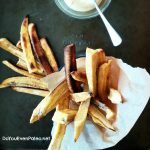 Peel plantains and cut into “fries”. I do this by cutting each plantain in half horizontally, then cutting each piece in half vertically, and then slicing these quarters into three fry wedges. In a medium-sized bowl, toss the plantain wedges with melted coconut oil and salt. Arrange plantain wedges on a cookie sheet lined with parchment paper. Be sure none are touching! Pop the sheet into the oven for about 15-20 minutes, flipping halfway through. In a tall, relatively thin container, combine egg, apple cider vinegar, and 1/4 c of the oil. Let sit so everything comes to room temp together while you make the plantain fries (or about 30 minutes). Insert an immersion blender and blend, keeping head of the blender on the bottom of the container. Once everything is mixed and the emulsion has started to form (it should look somewhat creamy and juuust be starting to thicken), start drizzling in the rest of the oil. At this point, I usually slowly raise the immersion blender up to the top of the emulsion and then back down – I get thicker mayo this way. This should take about 1-2 minutes. If you’ve ever made blender mayo, this is definitely faster, but for it to be “fail proof” you still have to add the oil slowly! At this point, It should look like mayo. Thick, delicious, creamy mayo. Add in the chipotle powder and give it a final blend to mix it in! If you don’t have FlavorGod Chipotle OR a different chipotle blend, try a 1:1 mix of chili powder and paprika. I dig it.